Lying in the Southeast Asia, Vietnam is one of the densely populated nations in the region and is officially called as the Socialist Republic of Vietnam. Blessed by nature, Vietnam is a beautiful country with a rich and exotic culture. Vietnami people with vibrant culture celebrate various festivals and events with great fun and fanfare. Adventure Silk Road Inc offers to give you online information on Vietnam festivals and events. Due to its long association with its neighboring country China, Vietnam culture also has a major Chinese influence. With majority of population being rural, community spirits is really high in Vietnam. With festivals and events forming an important part of their lives, the festivals are more agrarian based and celebrated throughout the year. Festivals and events in Vietnam are celebrated with great enthusiasm. Various games like tug of war, buffalo fights, rope pulling, pigeon race etc. are an important part of the festival celebration. 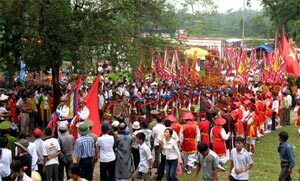 Festivals and events like Dong Ky Festival, Keo Pagoda, They Pagoda Festival, Huong Festival, Dong Festival etc. are some of the important festivals of Vietnam. Folk songs, traditional music and dance form an important part of these festivals. Festivals and events form an important part of the Vietnamese culture. For, generations festivals have been an important cultural activity of the Vietnamese people. 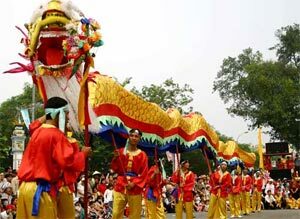 Master Pagoda is an important festival and event of Vietnam with puppet shows being the main highlight. Most of the festivals and events of Vietnam are dedicated to the natural powers like rain, cloud, lighting etc. Besides, the foot tapping drumbeats and traditional music create an atmosphere of joy and enthusiasm in these festivals. 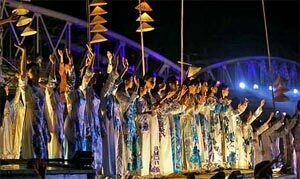 Vietnam festivals and events are also marked by the remembrance of the national heroes and various religious ceremonies. Festivals in Vietnam are the occasion to dress beautifully and show their customs and habits. This is the time when one can witness social encounters and springing up of new relationships. Tet or Vietnamese and Chinese Lunar New Year are the most important festival of Vietnamese people. The festival is celebrated sometimes in between late January and early February. It is a minimum three-day affair and is the time for enjoyment, family reunion and paying respect to the ancestors. Gifts are also exchanged between near and dear ones during this important Vietnam festival and event. Major festivals in Vietnam are Lim Festival (Quan Ho Singing), Do Son Buffallo fighting festival, Hung Kings Festival, Tet "New Year" Festival and Mid Autumn Festival. Each year on the last day of the Khmer calendar, the Khmer, an ethnic minority group living in the Mekong delta province of An Giang, hold a festival to honor their ancestors. The festival begins with a visit to the pagoda, where Khmer families invite the souls of their ancestors to dine with the living. Should any visitors appear during the festival they will be warmly received since the Khmer believe that guests who arrive around New Year are messengers sent by their ancestors. The Buffalo Fight in Do Son (Haiphong City) is officially held every year on the 9th day of the 8th month of the lunar calendar. There are, in fact, two rounds of elimination before the middle of the 5th month and 8th day of the 6th lunar month. The Kiep Bac Temple, where people come to worship Tran Quoc Tuan, the main general of the Tran Dynasty, is located in Hung Dao Commune, Chi Linh District, Hai Duong Province. Tran Quoc Tuan was the general who defeated the Chinese Nguyen-Mong invaders three times. Because of his merits to the nation, he was proclaimed a saint. To get to Kiep Bac Temple from Hanoi City, take the National Highway that leads to the township of Bac Ninh (about 30 km). Then, go along National Highway No.18 that stretches from Bac Ninh to Pha Lai, and which eventually leads to Kiep Bac Temple. The Kiep Bac Temple Festival lasts from the 15th to 20th day of the 8th lunar month. The Oc Om Boc Festival is a religious service to worship the moon god of the Kho Me minority group. The festival is usually held on December 15th of the Buddhist Calendar, or in October following the Gregorian Calendar. At this religious festival, people thank the moon god who brings about good crops, provides abundant fish in the rivers, and maintains the health of human beings. During the night of the full moon, as the moon appears, people prepare a feast in the front yard of the pagoda or in their houses. A plate of green rice flakes, ripe bananas, fresh peeled coconuts, mangoes and other dishes are served to the moon god. On the last ten days of the sixth month of the Cham calendar, the Cham people bring precious gifts to their ancient Cham King. This ritual is held to thank their god beforehand and to ask for help in organizing the Kate Festival. At night, everyone from the villages gets together to see the ritual performances of the traditional costumes (Poh Akharao). This traditional dance performance is accompanied by the solemn Kapo music rhythms. The hymn is accompanied by the rhythms of the ancient Kanhi and tells of the the power of the people. Other rituals include the washing and dressing of the Statue of the King with mineral water and the offering of wine in worship. The rituals lasts throughout the day and into the night, concluding with a performance where people compose and recite poems while playing music. The festival is a very exciting time because people from everywhere can converse, share in the same feast, and walk the same path.